Each week, I receive emails from parents seeking advice. I am not a trained therapist, psychiatrist, psychologist or social worker. I’m just another parent. But I feel compelled to answer most of these emails with suggestions that are based on my travels and personal experiences. What follows is an email that is representative. In addition to publishing my response, I have asked several highly-respected advocates to respond to the same email. I will print one of their responses each day this coming week. I hope this week-long exploration will spark a helpful exchange of ideas and give parents practical advice. From my dealings with my son, I know how horrible this can be and how worried you are. Here are ten suggestions. 1. Please know that you are not alone. There are many parents dealing with the same issues as you. I would urge you to contact your local chapter of the National Alliance on Mental Illness or Mental Health America. Perhaps some of the parents in those organizations can offer you guidance about how to best deal with your local mental health system. You also might wish to take NAMI’s Family to Family course. It can help you gain perspective. 2. Have hope. Never give up. Sometimes parents have to change their expectations. These are cruel diseases that last a lifetime, but without hope no one ever gets better. You have to believe your son can get better if you want him to get better. 3. If your son is living in a homeless shelter, contact its director. The shelter might be a way to get your son into a local treatment program. Don’t be shy about being an advocate even if your son doesn’t want your help. Let officials know that your son has someone watching over him. 4. Find out what is available from your local mental health department. Does it have a crisis response team? I would NOT call the police. Even if you are fortunate enough to get a Crisis Intervention Trained officer, your son has not broken any laws. Both times that I called the police, it ended in a disaster. My son was arrested and shot with a taser. Only call the police if you believe your own life is in danger. 5. Seek help from others. See if your local mental health department or a mental health group has a peer to peer program and if so, learn if there is someone with a mental illness willing to speak to your son. Reach out to someone familiar with mental illnesses who your son might trust. Don’t waste time arguing with your son about his delusions. 6. Familiarize yourself with the law. The Treatment Advocacy website is a good place to learn about involuntary commitment laws. But I would only seek an involuntary commitment if your son became so psychotic that you feared for his or your safety. You mentioned that your son has an alcohol problem. That is not uncommon among persons with mental illnesses. About forty percent self-medicate. Many states have laws that permit parents and others to have a loved one involuntarily committed for drug or alcohol use. In Florida, it is the Marchman Act. These laws have lower thresholds than “dangerousness” because addictions are already considered dangerous. Again, I would only use involuntary commitment as a last resort because it will more than likely drive your son further away from you. 7. Contact professionals. Xavier Amador has written a book called I’m Not Sick, I Don’t Need Your Help. In it he offers practical advice. You can read more about his work at LEAP Institute. Another excellent source of information is Shrink Rap. There are several other websites that offer insight into mental illnesses. If you seek professional help from a psychiatrist in your area, do some research and make sure the doctor is worth seeing. Oftentimes, community psychiatrists are more familiar with patients, who don’t think they are sick, than private doctors. 8. Realize that the healing process will take time. Your son didn’t get sick overnight and he is not going to get well overnight either. There are no quick fixes for severe mental disorders. You are in this for the long haul. 9. Understand that there is a limit to what you can do. I wear a chain around my neck that has the Serenity Prayer on it. “Accept the things I cannot change.” But I add — accept them begrudgingly and only for this moment. Advocate for change. 10. Get involved in helping others reform our system. Helping others will help you too. Tomorrow: Dinah Miller, MD., a psychiatrist, author and past president of the Maryland Psychiatric Society responds to A Concerned Parent. My Three Shrinks: a podcast, with 55 episodes aired on iTunes. Dr. Miller’s newest book is a novel, HOME INSPECTION. It is a fictional story about Dr. Julius Strand, a psychotherapist who plods along in his already-lived life until two of his patients inspire him through their struggles to find love. Hello, Thank you for posting this letter. Our son is also bipolar, and we have been through the spectrum of possible scenarios. My heart goes out to you and to your son. Even though our son has gotten help in the past, and is now on disability, so he gets a small check from the government each month, we still don’t know what to do when he goes into a new manic episode. Your comment about being told to let him ‘hit rock bottom’ resonates in particular. We have been told the same thing, by those in the ‘health care system’ and he has been made to feel guilty for living with us when he is under treatment, even though he is disabled according to all authorities! Last time he was hospitalized, at his own request, because he saw it coming, one of their recommendations to him upon discharge (which was far too early) was that he look into move into a group home, instead of living at home with us. These kids need more help than they are getting, and when I contact NAMI, as Pete has suggested, so far, all I’ve been told is to come to their meetings. The meetings fall on a day we already have a commitment, and there is no bipolar-specific group that I know of. I’ve taken the ‘Family to Family’ course they do, and while there were some people there who empathized, I did not find the concrete help we need to help our son stop when he is on the way into a manic episode. There simply must be a better way to find help when we need it, even in this messed up society, where the constant, day in, day out media coverage is about how the super rich NEED to keep their share, and all social services are being cut. I can’t believe that there’s no hope in sight. All the best to all who struggle with this situation. My deepest sympathies to you, your family and your son who is suffering greatly. We understand and have been on the same lonely, frustrating road as you. Hang on. Pray. Educate yourselves by reading books, the latest articles, journals. Talk to those who’ve walked in your shoes and your son’s shoes. Look for the best of the best doctors/counselors/social workers when possible. Think with your intuition, gut instincts, not just your brain. Don’t always take “No” for an answer with social services, counselors, hospitals, doctors or even your son. Get a doctor who is a top diagnostician; you’ll recognize him/her when you see them with your loved one. Be aware of “signs and subtle clues/hints” that your son is decompensating or getting worse. Perhaps an “intermediary” person your son knows or trusts could connect with him out on the street and pass along info back to you about his condition. Pace yourself/take care of yourself emotionally/seek your own professional counseling, as you cannot help him if you yourself are drowning emotionally. I’m not a mental health or addiction specialist/professional; I’m a sibling who became my brother’s advocate and case manager by default, who learned by trial and error, and the horrors of “this broken system” via my brother’s journey into mental illness (schizophrenia/schizo-affective disorder). Not sure if your son’s diagnosis is addiction and/or mental illness, but I think the advice: “He (your son) needs to hit rock bottom and want help…” may be well meaning, but it doesn’t truly apply to mental illness, but more to addiction issues, in my opinion. Is there a remote possibility that his brain is malfunctioning due to a physical brain issue? Has he ever had a complete neurological exam with tests, MRIs or CT scans to eliminate other possible central nervous system issues: brain tumors, brain illnesses/dementia, drug overdose, head injury, etc., that affects the brain? Self-awareness is often lacking in serious mental illness so a person is genuinely clueless that they are even sick, let alone need counseling, doctors and meds. This is not about classic denial that addicts exhibit, but something called anosognosia: the absence of understanding that they (patient), indeed, have a brain disorder/mental illness. 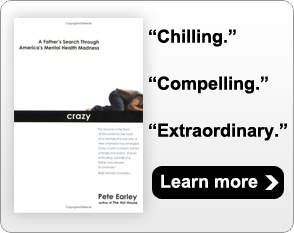 Xavier Amador’s book that Pete mentioned above is a MUST read for all family members of the mentally ill. When my brother had his first psychotic break from reality, my sister and I planned an intervention with our parents — (who were unable to act on their own due to their own shock about his sudden, late-onset illness) — based on the advice of psychiatrists we consulted on our own. He was also committing anti-social acts in public that put both him and the public in danger. After stealth, “fly-by-the-seat-of-your-pants” planning, the four of us managed to get him into a two-door car (where he was unable to jump out-though he tried to do so) and drove him to a hospital where he was stabilized on medications. I remember waiting for what seemed like an eternity before he was admitted because the insurance company was battling the hospital against admitting my brother…. (As if we family members don’t have enough battles to fight for our loved ones with mental illness….the insurance companies have to add a little more hell to the hell we’re already living in….) Seventeen years later, we’ve experienced additional hospitalizations and “close calls”. There are times when I’ve been so exhausted emotionally, mentally and physically, that I didn’t think I could continue to care for him, but those are the moments I realized that “There but for the grace of God go I…” and I get back into the “lifeboat” with my brother and “keep paddling.” I don’t let his illness “consume” my own life, as much as practically possible. I “step out” of the world of mental illness when my brother is stable and “forget” about his illness and don’t live it 24/7. I feel some “relief” in knowing that I can pick up on the subtle clues when my brother is decompensating so I get a “jump start” and tell his doctors, counselors, meds nurse, when he’s losing ground. That ability to “anticipate” and intuitively pick up on his symptoms AND ACT UPON THEM is the best possible “defense” in helping him stay on his meds and out of hospitals. Being aware of doctors who were, at best, not helping, and, at worse, not being pro-active when his symptoms starting acting up, helps alot. I hope this info helps you and your son in some way. Know that you are not alone. And that for all of us dealing with loved ones who have mental illness, “There but for the grace of god, go I….” Good luck. Awesome post.. I can relate to Pete’s story and most everyone’s post on here, with the exception of when I have gotten the police involved – they have all been most helpful and caring. If you would have talked to me one year ago, I would have said that I do not know if there is hope in our case with our son. I do not feel that way today, HOPE, PRAYER and ADVOCATING – lots of advocating behind the scenes … for things to take a twist in the right direction. I just really wanted to say ( as a Mother of a child with a severe MI ) how great it is that you have helped (help) your brother AND PARENTS so much and became informed and took interest in HELPING….that is not always the case. It is easier when their is a family team involved…again, not usually the case. My deepest appreciation and homage to you!! I have not lost my HOPE because of Pete and all the other parents that speak out. My son now 30 was stricken when he was 17 with his first psychotic break. He is able to tell me he knows he felt bad all through middle school and high school but I did not know what he was going through then. As I think back to when he was a child when he always covered his ears when we were in noisy places that should have been my first sign something was wrong. He has been diagnosed with schizoaffective disorder/bipolar. I now after 13 years of knowing he is sick get a gut feeling when he is going to breakdown. He is starting his decline in November and I feel by Chirstmas he will crash. The last time he was hospitalized in Dallas, Texas March 2011 the doctors and nurses would not listen to me or talk to me and my son nearly died from the medicine they gave him! So far he has reacted adversely to every medication. I will not let him go to a hospital the next time he breaks. I don’t know what I will do. Calling the Police has always ended in greater disaster. What to do, what to do? Sorry, I meant March 2012. I have to comment on NOT calling the police. As a parent of a bipolar child, a police officer and a CIT instructor, I am saddened that you feel this way. I have helped trained thousands of officers and have personally assisted hundreds of families without having an incident. If you are unfamiliar with CIT training, perhaps I can give you some insight. We train our officers to respond to the whole family in crisis, not just the consumer. Our goal is to get the consumer to a hospital without using force unless the safety of the consumer or others is at risk. Once the consumer is taken safely to the hospital our officers not only provide empathy, but resources as well to the families. Each situation is always different than the next and I could never guarantee the outcome of any incident. However, we as police officers never want to intentionally harm anyone and to paint us us all with one brush is prejudicial. I am sorry for the experiences you have endured but please know there are many great officers out there trying to make a difference. Remember we go to work everyday never knowing if we will return to our families. That is the job we chose and i couldn’t be prouder to serve. I meant no disrespect to the police. I thank and admire them for the most part. I hope there are just a few exceptions. The last time I had my son picked up at our home by two CIT trained police officers they did a magnificent job. They were patient, kind and compassionate. The two police officers were serving a mental health warrant. I had the opportunity to talk to them first so that they would understand the situation better. On the street, however, in the past years my son has been brutalized and profiled by police officers. I hope Crisis Intervention Training will help everyone. I am sorry to say that my family and I agree with this warning. My brother was suffering from psychosis and when we called the police — this was because the hospital had told us to do this after we had taken him ourselves once while he was having a crisis — but it ended in disaster as well. The cops were advised that he was delusional and feeling paranoid. One of the cops got too close and my brother hit him in the eye. These were supposed to be CIT trained officers. We thought he did everything right and everything went terribly wrong. He was arrested, he got so psychotic in the jail that he was unable to present himself before the judge until almost 6 days after his arrest and he had received a black eye, and multiple injuries at the hands of the correctional officers. Therefore, unless we can begin to trust the police department and their training, my family and I would rather run the risk and get him safely to a hospital to the best of our abilities and resources. I wanted to share a comment from a reader who read this post and commented on my blog’s Facebook page. She is not only a trained CIT officer for the city of Chicago, but the mother of a young adult son with Bipolar Disorder. She mentioned that trained CIT officers are amazing and do great work. I agree. We have had tremendous success with CIT officers responding when we needed them. So much so that my husband and I participate in training for the Chicago Police Department. out of their preferred and normal senses. symptoms as they arise. A good therapist with knowledge and compassion can help him with this. I will tell you now that I live a happy and normal life, and have had bipolar for 43 years. ,What I tell you is true, and good medical practitioners will back it up. I pretty much taught myself, but nowadays these self-help techniques are well known- – they just don’t make any money for the system! learns how to control and navigate around the bipolarness. your son’s rights to a state of mind he is comfortable with. disappearing mind were being turned away. I have been as your son several times over and I know that feeling, of urgency in needing help right away. keep routines, verbally and visually remind him who he is and what he values. As unorthodox speech or behaviors may become apparent, roll with it in an understanding manner. Empathize, calm, and allay his fears, Always assert that you will get thru this together and that his pain and discomfort is temporary. I have seen unmedicated, completely psychotic people being held and rocked in loving arms.Make him feel safe. Love for your son, and his love for himself, along w/ meds and good therapeutic practices is all any mentally ill person needs to stay well. I have been sharing your blog all over Facebook. It should be going “viral” — unlike a very problematic blog post recently. I always mention your books to parents struggling with these issues, too.